It was a message unique in the history of telegraphy. Opesti nipitia secomba. These words, written in Martian, were relayed from London to the Red Planet on 27 October 1926. The sender was Dr Hugh Mansfield Robinson. The intended recipient was a six-foot, big-eared Martian lady called Oomaruru, with whom he'd been in telepathic contact. Dr Hugh Mansfield Robinson was a former Town Clerk of Shoreditch and a Doctor of Laws. His picture in Hackney Archives, painted around 1912, suggests an austere, sober character. Yet just a few years later, this public servant and man of law was claiming to be an interplanetary psychic. Robinson first heard from the Martians in 1918, and his astral body supposedly visited Mars on several occasions. He describes a planet populated by men seven to eight feet tall, while the ladies were over six feet. "They have large ears sticking out on each side of the head, a huge shock of hair massed high, and a Chinese cast of features." These are described as 'intensely religious' beings, who treat atheism as a form of insanity. "They have great airships run by electricity. All their power is electrical, run from the harnessing of the canals and waterfalls in the mountains. They are consequently many generations in advance of us in wireless knowledge", the doctor elaborated. He also spoke of their society, believing that labour strikes were unknown, that the population was decentralised out of cities, and that their numbers included a lower caste of beings lacking in intelligence, and with heads shaped like that of a walrus. The good doctor seemed taken with one Martian in particular, the lady Oomaruru. He claimed to be in regular telepathic contact with this girl from Mars. She is described as very fair, with a sweet face and big ears that "did not especially detract from her beauty". Oomaruru, whose name meant 'loved one', was a close friend of the director of Mars' biggest wireless station. With her help, Robinson hoped to convince the world of his interplanetary psychic wanderings. 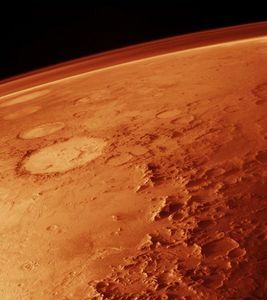 In 1926, Mars was 8 million miles closer to Earth than average. Astronomers everywhere were polishing their telescopes to make observations. In London, Dr Robinson instead sought the services of the Central Post Office near St Paul's. He handed the telegraphist a missive written in a mysterious language he claimed was Martian. Opesti nipitia secomba. The puzzled telegraphist relayed the message to a transmitter at Rugby. From here, it was beamed into space on a wavelength of 18,240 metres. Receivers then listened out for a reply at 30,000 metres, a wavelength Dr Robinson believed the Martians to favour. The post office had no precedent for such a long-distance message, but was very happy to take Robinson's custom. An official from the Central Radio Office commented: "If people wish to send messages even to the moon and the man theron, and are prepared to pay for them, there does not seem to be any valid reason why the post office should refuse revenue." Robinson was billed 18 pence per word for the radio transmission, equivalent to the long-distance ship rate. Alas, his pennies were wasted. A day later, the Post Office confirmed that no signals had been received that could have emanated from the Red Planet. Robinson dismissed the negative result, claiming that other stations might yet receive something, and later saying (but never proving) that mysterious replies had been received. Few were convinced. Robinson made a further attempt two years later during another close pass of Mars. This time, the message was "Mar la oi da earth. Com ga Mar" (love to Mars from Earth. God is love). Again, no signal was received, at least not by radio. "I am advised by my telepathic friends on Mars that they did not receive our message owing to the layers of rarified air", Robinson explained to the press. The press, indeed, were quick to ridicule him, and not just the British newspapers. The Pittsburgh Post observed that the: "Apparent failure of his attempt to communicate with Mars by radio early today did not discourage the psychic student. Neither did the attitude of his wife, who sniffed at her husband's spiritual wanderings among the planets accompanied by a Martian girlfriend with big ears; nor the frankly sceptical attitude of the world in general and men of science in particular." The Aberdeen Journal, meanwhile, suggested that the lack of response might be the fault of the Martians rather than any oversight on Dr Robinson's part. "There may not have been the speeding up process in the Martian telegraphs department that there has been in ours in recent years", it sneered. Robinson also claimed to have a recording of the national anthem of Mars. The ditty was also conveyed by his Martian ladyfriend Oomaruru, through an Earth-bound medium called Mrs St John James, the wife of a London clergyman. Sadly, its tune is lost to posterity. Robinson wasn't alone in his beliefs. A Professor AM Low of Turnham Green, a 'well-known member of England's younger scientific group', purported to know somebody who'd been to Mars and met its inhabitants. The Martians they saw sported two thumbs on each hand and telescopic eyes. He did not, however, think Robinson's radio techniques would be powerful enough to make contact and instead prescribed a huge piece of sky-writing to get a message across. Others were less certain. Arthur Conan Doyle thought the efforts uninteresting but noted that he had no doubt contact with Martians would one day be possible. Leading physicist (and part-time spiritualist) Sir Oliver Lodge, meanwhile, dismissed the experiment, pointing out that there was no evidence Mars was inhabited. Perhaps Robinson's fiercest critic, though, was his own wife. After the 1928 attempt failed, she's quoted as saying "I don't know anything about this Mars affair. I have refused to have the experiments conducted in this house while I remain in it. I don't know whether anyone encouraged my husband but there will be no more of that foolishness in this house." Robinson never gave up his quest to speak to the Red Planet. In 1929 he tried again using an ordinary wireless set augmented with a 'psycho-telepathic motor-meter'. In 1930 he founded a college of telepathy whose staff included a telepathic dog called Nell. Then, in 1933, he claimed to have recorded the voice of Cleopatra, now a jilted farmer's wife living in a glass house on Mars. Quotes and info are taken from many newspaper sources. Contact matt@londonist.com if you'd like further information on any particular point. Some free-to-view accounts of Dr Robinson can be found on Google News, and there's also this recent essay on his work.